The first thing you need to do is develop a budget and then enter it into QuickBooks. When you enter a budget into QuickBooks you will do so for a fiscal year, but you will enter it by month. Probably the best thing to do is run a profit and loss for the year prior to the year you are developing a budget for. You will want to get your prior profit and loss in the same format as your budget so you will need it by month. In order to get the report in this format run the profit and loss and then in the columns drop down box select month. You then need to decide if you want to collapse this report into a simpler format or leave it expanded (I prefer and recommend the collapsed version). I would then export this report to excel and use it to help you develop your current budget. There is a good chance that you don't have a clue where to start with developing a budget; especially if you have not done it before. You may need some professional help with developing a budget or you can tackle it on your own. Don't be intimidated, but take your time going through it. As you go through each month ask yourself where you would like to see your numbers for each category. You may need to do some percentage comparisons to see what a normal sales growth rate is. Then determine where you want this to be. When it comes to expenses most have an initial reaction to just cut expenses. However, be logical and realistic. Some expenses like advertising you may actually want to budget for an increase to help meet your sales goals. When it comes to creating a budget I like to be realistic, but also aggressive. Remember all you are doing is developing goals and a benchmark to measure your actual performance against. After you develop your budget you now need to enter it into QuickBooks. From the main menu bar select Company/Planning & Budgeting/Set Up Budgets. In the upper left hand corner click on 'Create New Budget.' Select the year you are creating a budget for and then select either profit and loss or balance sheet (I am going to use profit & loss for demonstration purposes). You will have some options, one of which is to create the budget from scratch or use the prior year's actual data. If you select from scratch this will pull up a blank form that lists your accounts in the first column and then has subsequent columns for each month. Now fill in the budget that you created from your excel sheet. 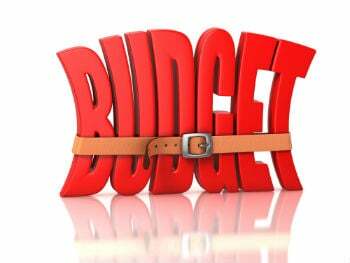 This budget can always be modified and you should revise it a few times before you consider it your final budget. Now that you have developed a budget for your small business and entered it into QuickBooks you should learn how to report on it and use it to keep your business on track. The most frustrating thing for me to witness is when a business spends time and resources to develop a budget and then never uses it. Run a budget vs actual report in QuickBooks by selecting Reports/Budgets & Forecasts/Budget vs Actual. You then need to select the budget you wish to use for your comparison. The next screen will ask you for a layout option and you should select account by month. I find it kind of annoying to walk through these several steps each time I want to look at a budget vs actual so I memorize the QuickBooks report in this format. That way the next time all I have to do is run the memorized budget vs actual comparison and change the dates as needed. Now that you have gone through all of the trouble to create a budget and enter it into QuickBooks you need to actually take the time to analyze it. I would say that I look at our budget vs actual approximately 2-3 times per month. Most business owners would be lucky to look at it once a month. Be sure that you are looking at your budget vs actual report at least once per month. Take a look at both the positive and negative aspects of this report. What are the areas you need to improve upon? Are there any opportunities that you need to take advantage of? Be sure to communicate your budget findings to your team and hold them accountable to make the necessary adjustments. Simple analysis of your budget vs actual financials and communication to your key team members of your findings will keep your business on track. Do you create a budget for your small business each year and analyze it? How does it help your business?